For years, people have been customizing their golf carts by adding audio systems, lift kits, custom wheels, custom upholstery, and more. Whether they use them on the golf course, around the farm, in the pits at the racetrack, or to cruise the campground, people want their golf carts to be personalized and fun. Adding an audio system does both, but installing a golf cart audio system has its challenges. Golf carts don’t have sophisticated data systems that require interface modules like most cars and trucks, but they do have a lack of space, acoustical imaging problems, lack of protection from rain and water, and limited electrical current available for additional electronics. 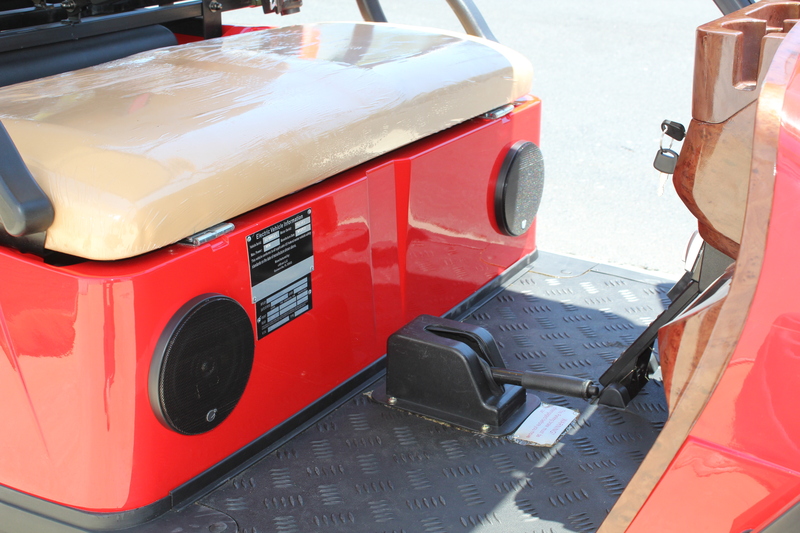 Over the years, we’ve seen tons of custom golf cart audio installations. Speakers molded into the dash, speakers cut into the fiberglass body, wakeboard tower speakers bolted to the roof, crazy PVC tube systems with speakers in the openings at the end, and even custom built enclosures bolted to the roof. Most people don’t want to cut up their golf cart as that is a fairly permanent customization and requires a certain level of skill that most wives don't appreciate. Creating custom enclosures that fit inside the storage compartments of the dash is also a time consuming and expensive option. Many of the golf cart audio “systems” you find online are not manufactured as a completely finished product. 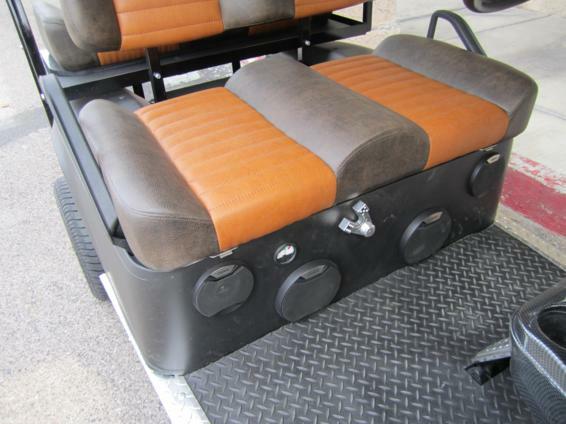 Most are just a bunch of marine audio equipment pieces adapted to fit on a golf cart. They are not manufactured as the finished system you end up getting. We’ve seen amplifiers installed under the seat where the motor and battery are. It’s a logical place being next to the battery and it is out-of-the-way but the close proximity to the engine means there is a lot of heat build up that you don’t want to expose your amplifier to. Also, the bottom of the engine compartment is open to the ground, this means water, mud, dirt, and other debris can get to the amplifier. Additionally, amplifiers can put a lot of stress on a golf cart’s electrical system, especially electric golf carts. Electric carts might have a 48 or even a 72-volt system, but a lot of that electrical power is being used to drive the cart and gas golf carts typically have very small 12-volt batteries. A system that requires more electrical current than your golf cart can offer will not perform and will require adding an additional battery to the system. An audio system that doesn’t pull a ton of current makes the installation much easier. Plus, if the golf cart is electric, it will most likely have a system that is higher than 12 volts so you with either need a separate battery for the audio system or you will need a power converter from 36, 48, 72 volts etc... to 12 volts. If you want something that will really last and provide good audio, by the time you consider all of these things, a simple golf cart audio system may not be as easy as you thought. The system MUST be built from components that are designed to handle rain and moisture. You never know when you might get caught in the rain and electrical components and water don’t mix. 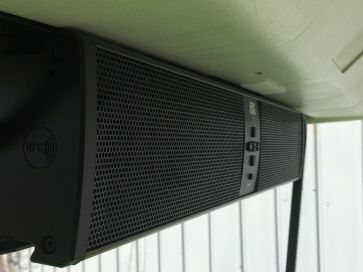 The connections of the speakers and amplifiers should be protected and/or built using materials such as gold or stainless steel that will resist corrosion. If the system has an enclosure, it is VERY IMPORTANT that it be sealed and built from a material, such as plastic, that does not absorb moisture. Not just a sealed enclosure like we would have in a car for our subwoofers… A truly sealed enclosure that will keep water and debris out. 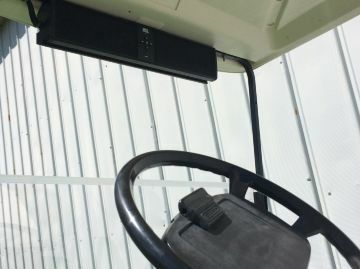 If you use your golf cart on a farm or at a dirt track where there is a lot of dust in the air, it is also nice to have an enclosure and audio components that can be sprayed off to clean any dust or dirt that may get on the enclosure or speakers. The system must be able to perform with the available electrical system. This means if you don’t plan on adding additional batteries, using powerful car audio or marine audio amplifiers is probably out. A system that is highly efficient will keep the electrical strain on your golf cart to a minimum. If you want a system with subwoofers and high power amplifiers, plan on adding a battery or two. A system with speakers that install close to ear level when seated in the golf cart will provide the best possible sound imaging. Installing speakers in the body panels at your feet does provide audio, but most people don’t have ears on their feet. You don’t install your home theater speakers under your couch do you? Sound coming from the front and traveling toward your ears will provide the best possible sound imaging. In a golf cart, there are no doors or windows to keep the sound in so it is very important to make sure the sound travels past your ears to maximize impact. The system should have as few moving parts as possible. Some golf car audio “systems” we’ve seen have car CD players molded into the dash, molded into the roof mount enclosure, or installed in the dash storage compartments. While that does provide an audio source for the system, the moving parts of the CD player don’t typically perform well when bouncing around off road. The CD player skips and eventually the circuit board will let loose making the CD player inoperable. A mech-less source unit, such as a Bluetooth receiver/remote control, is a much better option. Plus… Who uses CD’s anymore anyway? Golf cart audio systems can be completely custom with extra batteries, subwoofers, high power amplifiers, fiberglass enclosures, LED accent lighting, and more or they can be as simple as a bolt-on, all-in-one system with 3 wires. 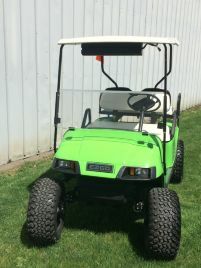 Having a golf cart with an audio system is much more fun than one without, but having a golf cart audio system that sounds good, can handle the outdoor environments golf carts are used in, and has the electrical efficiency to perform in a standard golf cart are very important factors to consider. 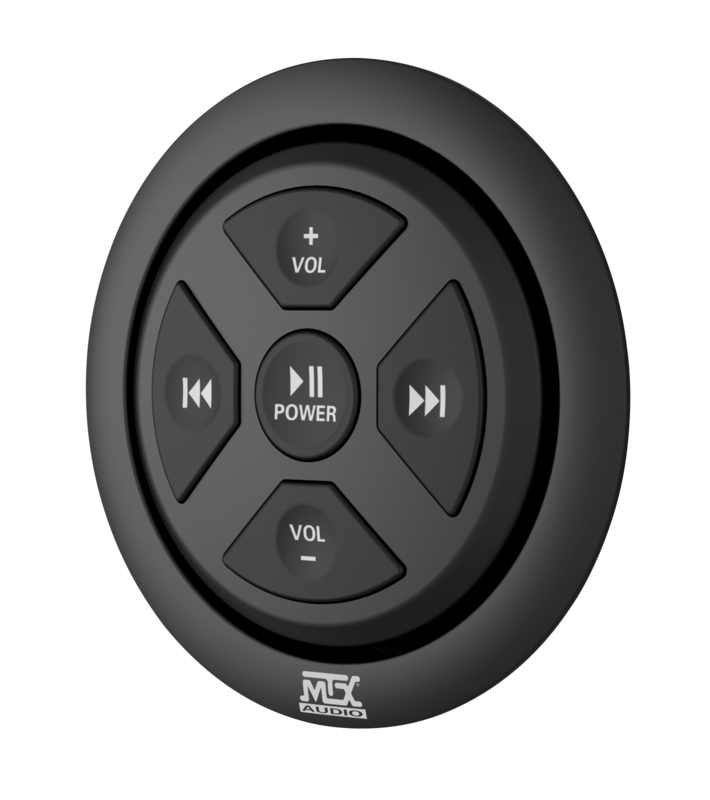 For a simple all-in-one solution check out the MTX MUD6SPBT unit that include speakers, Bluetooth, and more in a sealed, all-weather enclosure. For bigger systems the MTX BORVKIT1 and BORVKIT2 offer external speakers that can be mounted to the golf cart, a high efficiency amplifier, Bluetooth remote control, and everything you need to make it work.